If 1.5 million people sign up for an app within just two weeks of its launch then there is surely something to it and it requires a detailed analysis. I am talking about QuizUp, an app which was launched on 7th November 2013 and on 20th November TechCrunch reported “the game has signed up more than 1.5 million users, who have played more than 70 million matches over the past 10 days. So now that I have your attention, let me begin from the beginning. QuizUp describes itself as “the biggest trivia game in the world.” By trivia is meant facts from many different subjects which are used in a game to test people’s knowledge. 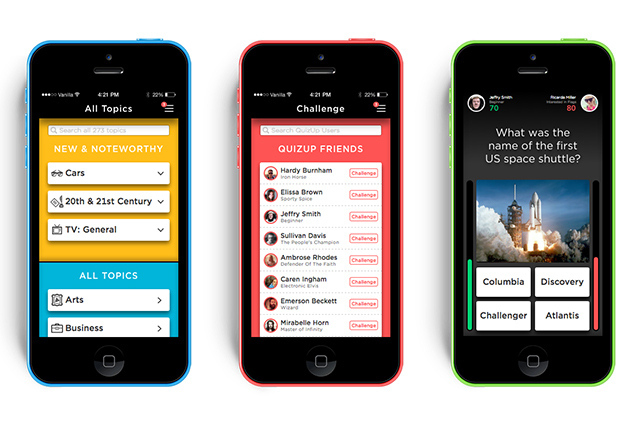 In more simple language QuizUp is an app where you can play a quiz with a competitor on any subject you both like. Your competitor can be your friend or a total stranger. The screenshot above may help understand the situation. After you download the app you will be asked to sign up. You can either sign up through your Facebook account or your Google+ account. Alternatively you can also sign up through your email address. Once you are in you will be asked to choose a topic. Initially you will be displayed about a dozen topics to choose from. These topics vary from Arts to Education, from Games to History, from Literature to Science, etc. Once you choose a topic you will be asked to select a sub-topic. For example if I selected Literature initially I can further narrow down the niche by choosing, say, Charles Dickens, and all the questions will then be put to me related to Dickens only. 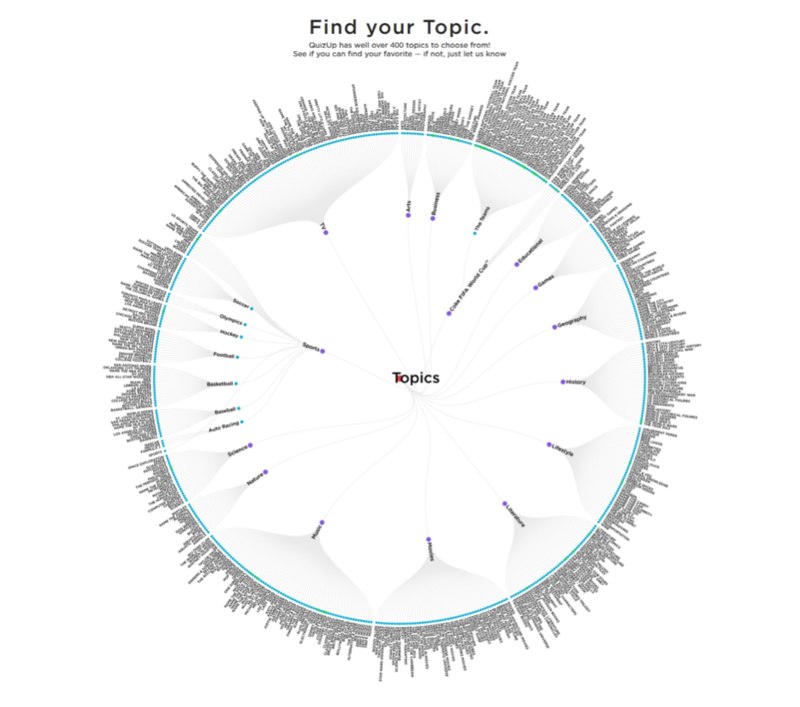 The screenshot below shows the huge number of topics and sub topics you can choose from. Once I have settled on for a topic I can choose to play the game with one of my friends or I can opt to play with a stranger. I can search for a friend by typing his/her name in the search friends option and QuizUp will display a list of all the people by that name. Or I can also search for my Facebook, Google+ and Twitter friends who are already on QuizUp by connecting my social media accounts. Then I am ready to play. As the third mobile screen above shows, the questions will appear at the center of the screen along with four options. Of course only one option is correct. My and my competitor’s names and scores will be displayed in the top two corners of the screen. Time is of the essence. Marks are awarded not just for answering the questions correctly but also on how fast a question is answered. Both people have 10 seconds to answer a question and if you don’t choose any answer within that time you will get no marks. So what’s the big deal, you might think? There are other trivia quiz based apps too in the app stores. Why is QuizUp so popular? One reason is definitely the way the app is designed. The app works very smoothly on any device you use it and the quality of graphics is unmatchable. And perhaps the main reason for its growth rate is that it began with 160,000 questions and today this number stands at 220,000. This ensures that questions are rarely repeated and the same users can go on playing the game more and more number of times without getting bored. Thor Fridriksson, the CEO of Plain Vanilla Games, the company which has created QuizUp, has given some interviews describing his app, the story behind it, how the app makes money, etc. You can watch the interviews here and here. If you are short on time, below I am extracting all information about their growth hacks and how they make money. The CEO says they are mainly getting traction from word of mouth publicity but I noticed two important growth techniques they have employed. Fridriksson says people like to show off their knowledge. He gave the example when a family is sitting before a television watching a trivia quiz game, the family member who knows the answer to a question usually shouts out the answer first before the TV contestant can answer. Similarly people today want to show off to their social media friends. The image also displays each participant’s score and then the name and logo of the app is displayed. The screenshot below demonstrates this. Although I must add that when I tried to share my results with my Facebook and Google+ friends, it didn’t work. Maybe there was a technical glitch. Anyways this method of sharing the results has worked wonders for the app. 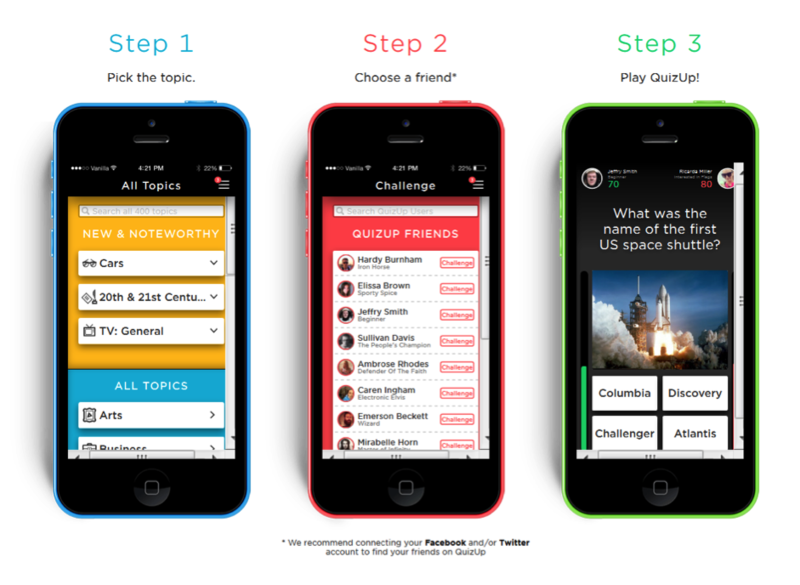 QuizUp’s core writers for the questions they have assembled in their data base were mainly freelancers. Instead of hiring people on full time jobs to write questions for them, Fridrikkson decided to reach out to different fan websites of different fields. They then talked to the people who seemed to be most interested in a particular topic and then requested them to write questions for their app. Some asked for money, others did it for free. In order to keep the app running and keep the players returning they needed more questions. Hence they allowed the users of the game to submit new questions on whichever topic interested them. Those questions are reviewed by an expert of the company and if approved, that user is given a contributor badge. This serves a two fold purpose. One – The company saves money as it doesn’t need to hire writers. Two – The users feel privileged that they are being a part of the app creation. How does QuizUp make money? This is an interesting question because if you will use the app you will find they aren’t displaying any ads. They are actually using native advertising. They tie up with different companies and work with them in developing some questions which are related to that particular company. For example their first sponsor was Google and Google wanted to promote its Google Maps. Hence they sat together and prepared some questions for the app which were related to Google Maps. This sort of advertising was not obtrusive and it was a win-win for all the three parties. 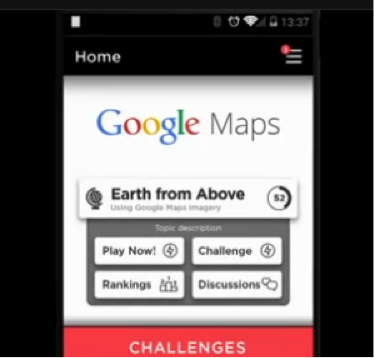 QuizUp got money, Google got publicity and the users got some new matches to play. Although QuizUp does have some other methods to make money but Fridrikkson says their primary income comes from the method explained here. 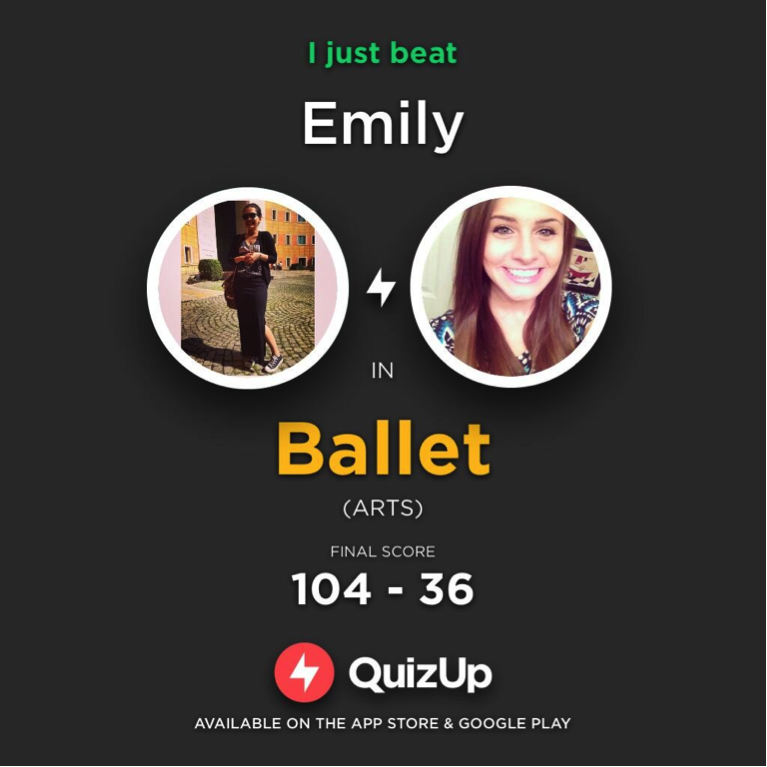 Have you played QuizUp? If not here are the download links for iTunes and the Play Store. Go and take a look and then let me know what you think in the comments below. Co-founder at AppVirality.com - Growth Hacking Toolkit for Mobile Apps, that helps businesses to identify and implement right growth hacks with no coding required. Dear Laxman, I got your write up when I googled the question on how quiz up makes money. Still I dont understand how investors push 22 million $ to them when they have not monetized? How do these models work? Sure Google would have given them some peanuts to push out a game. But not much. So whats the base idea to make money and when? @asif_osman:disqus they do monetize through in-app purchases and advertisements. In-App purchases i.e coins/points being the top contributor. I agree Ram. YeQuiz is much much better. The app has just got launched, but I think it will go a long way and give Quizup a run for its money!